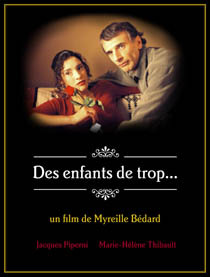 Des enfants de trop... is a modern take on the classic silent film. It tells the story of the first date between two strangers who meet after HE places a singles ad on a Web dating site. HE invites SHE to his place for dinner. In an attempt to put their best foot forward, SHE and HE inadvertently spark a series of comical misunderstandings about each other. Misinterpreting clues, each is led to suspect the other has a child. Then the evening is interrupted by a series of characters ringing the doorbell for all sorts of reasons just as the two are about to get more comfortable together. Will HE and SHE be able to discover each other's true character or will the evening become a missed opportunity?